Fungus normally grows on nails due to heavy moisture content and not proper care of the feet particularly toes. Another reason is diminished blood circulation or walking barefoot in public places. Prolonged use of socks also causes fungi (microscopic organisms) to grow on nails as this fungus does not need sunlight to grow. 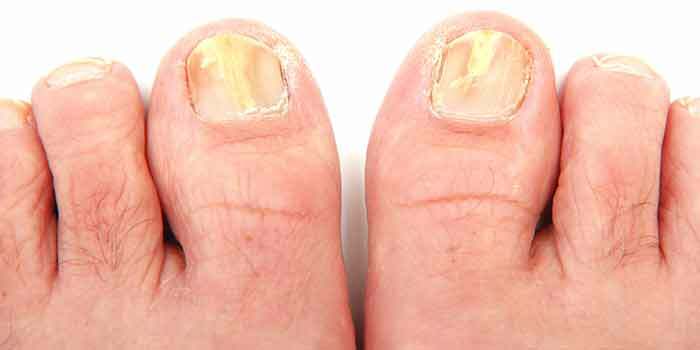 People diagnosed with diabetes, HIV and a weak immune system are also causes for Nail Fungus. Nails which appear to be blackish or yellowish in color, brittle are generally alarm signals that you have Nail Fungus. These nails emit a stinking odor and can at times cause pain. Rashes generally form around the affected area and can itch a lot. A few drops of vinegar applied daily on the toes can yield results, but slowly. The affected nail should be cut and the course applied regularly till new nails grow. The most effective way of treating this condition is Tea Tree oil. Take a cotton ball, soak it in the oil and apply it two to three times a day. Dry the area thoroughly after 10 minute and leave the feet uncovered. Rubbing alcohol can also be used to cure this condition. Using a sterilized bandage, dip it into the rubbing alcohol and vigorously rub it on the nails a couple of time a day. This should help in immediately arresting the growth of the fungus and finally cure the area. Hydrogen peroxide in its pure form can also be used. If it is unsympathetic to the feet then in a bucket mix the peroxide in water and soak your feet in it for about half an hour before going to bed. Dry your feet thoroughly with some absorbent material later. Another remedy is rubbing peeled onions on the affected area. Regular use of this will help the condition as well. Decolorized iodine is a great remedy for combating Nail Fungus. This treatment takes time but applying iodine (which acts as an antiseptic) at least three to four times a day is very beneficial. A very interesting home remedy is beer. In a container, mix beer with white vinegar and a packet of acidophilus. Soak your feet or hands in this solution once a day for month. Tou should see results soon. Another good treatment for Nail Fungus is Oregano oil. This should not be applied but taken orally with food and never on an empty stomach. There are certain things to follow when infected with nail fungus. Always wear cotton socks, wear soft and breathable shoes, and file nails properly and in time. Try and keep the affected area as dry as possible and refrain from sharing towels with others. Massage the area with creams to keep the area infection free. Clean and dust the inside of shows and use anti fungal powder in them. Though not life threatening Nail Fungus is an irritant especially to fashion conscious individuals and taking preventive measures as mentioned above should ensure healthy nail.